I have been on the look out for the perfect bag to use while babywearing. When baby is little and in the front you can get away with a backpack, but once you move to back carries it makes it really awkward to wear a backpack on your front. 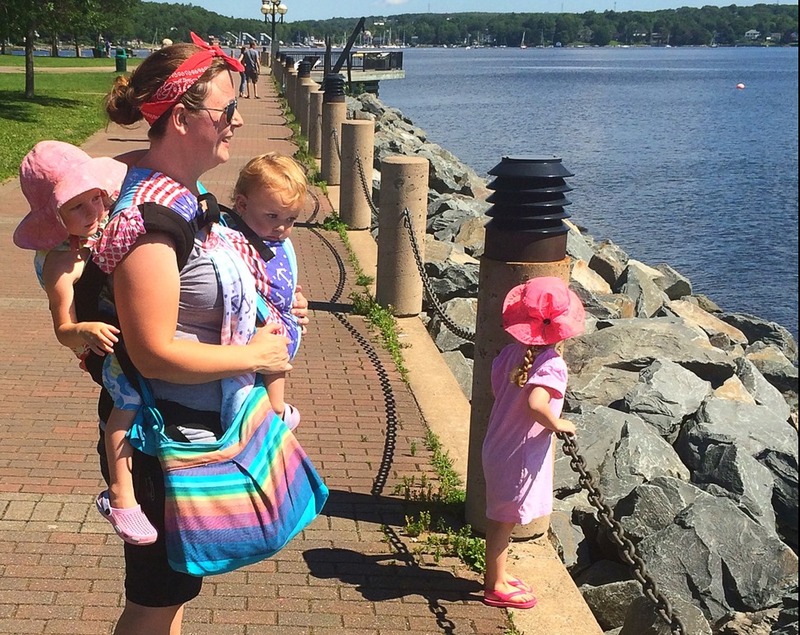 Cross body diaper bags work in a pinch but the straps are usually uncomfortable and dig into you and baby. 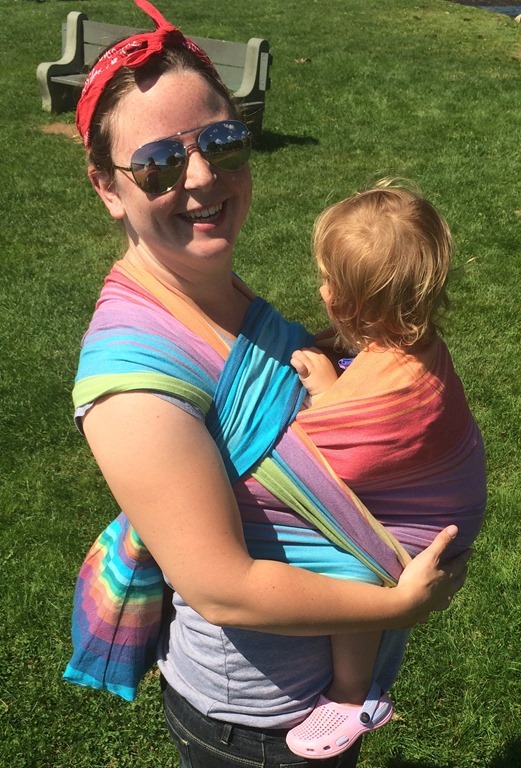 I have found a ton of babywearing bags that are specifically designed for use while carrying your baby (in a separate carrier, the bags are not carriers themselves), but for the most part each of the companies had wait lists and prices that were out of my budget. And then someone pointed me in the direction of Slingyroo bags, after a quick Google search I realized I had actually stumbled across these bags on more than one occasion but never would have guessed that I could afford one. Slingyroo bags are created by a company in Finland that also sell amazing and beautiful wraps and carriers. Liinalapsi –WearABaby is a company run by Niina Hallikainen and you can find her website here. I decide to contact Niina about doing a review and was so excited when she agreed. 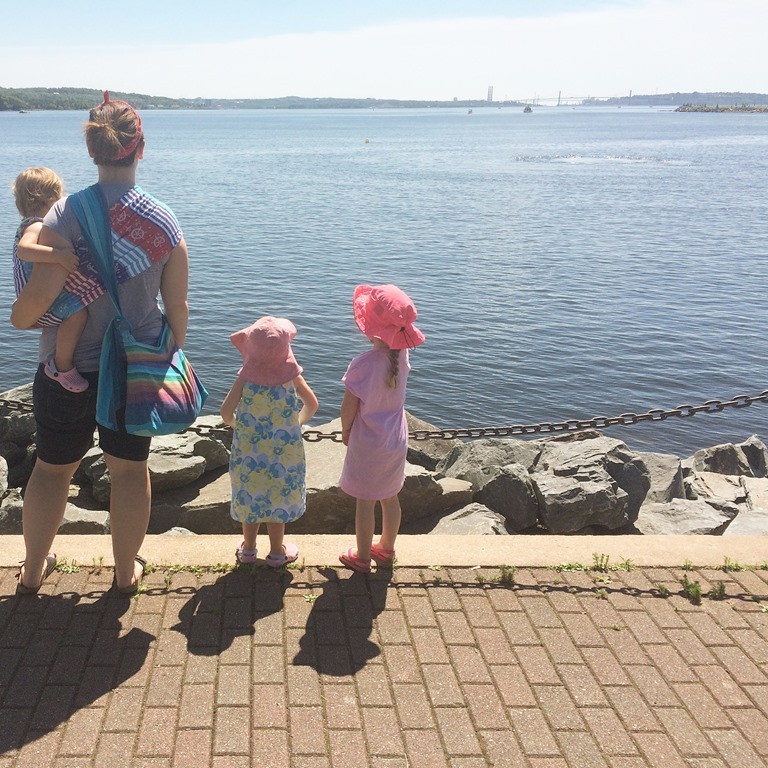 In the babywearing world you learn quickly that baby carriers tend to have a price tag that scare people, but once you learn more you understand why. The workmanship that goes into creating some carriers is incredible and well worth the price tag. 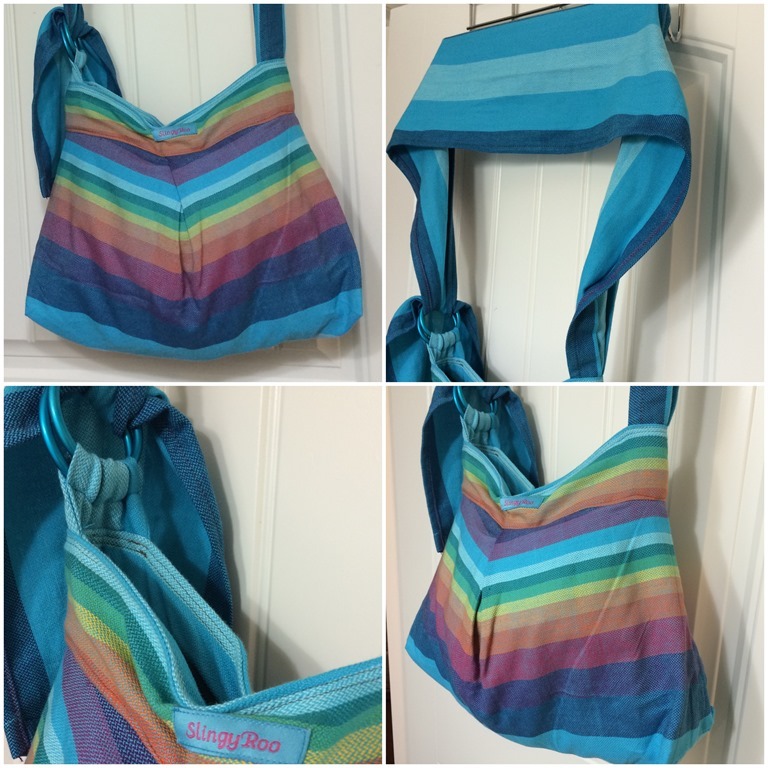 The Slingyroo is made from a few different baby wrap brands which is why it is not a $20 diaper bag (but really, none of my diaper bags have been $20 so this is not something that scares me). 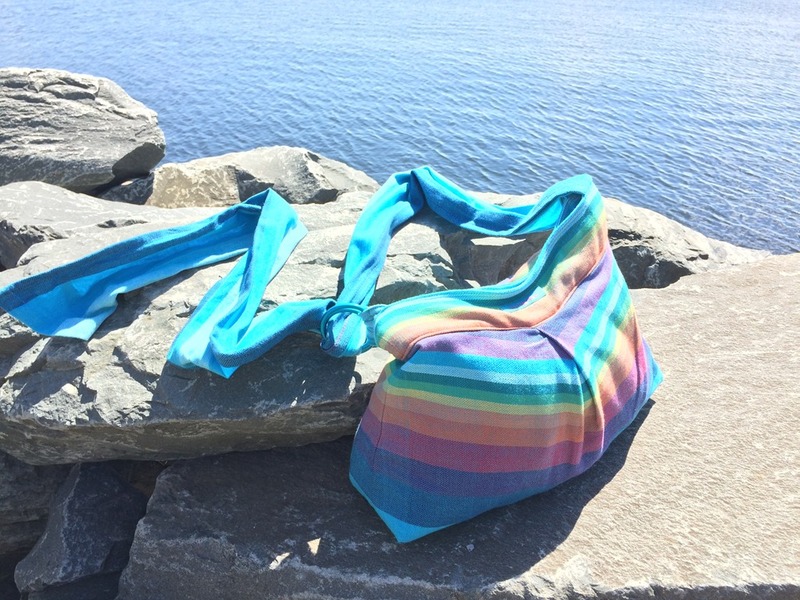 Slingroo bags are made from Girasol, Vanamo, and Kokadi wraps and start off around $94 USD, you can pick from in stock bags which is awesome, or you can have a custom bag made from a specific wrap that Niina carries; which is what I did. I picked the Girasol Double Rainbow Pacifico wrap for my bag. From ordering my custom bag, to them making it, and me receiving it from Finland took exactly 4 weeks – which is super awesome. I mean Canada Post takes that long just to ship a package from one Province to the next. This bag is so comfortable. The strap is wide like you would find on a wrap conversion Mei Tai, so it comfortably fits over your shoulder and spreads the weight of all the junk you carry around. The bag has a pocket on the inside perfect to fit your phone in, and then you can zipper the bag closed so you don’t lose any precious soothers, toys, or your wallet and keys. The strap is 1.5M long and attaches at one end to a pair of small ring slings so you can adjust the length. I was able to wear the bag over top of Lyra when I quickly tossed her up for a Costco trip and it didn’t dig into either of us. While wearing her in a wrap on my front I put the bag on my back and tightened the strap around my chest like a torso carry and we were both very comfortable. 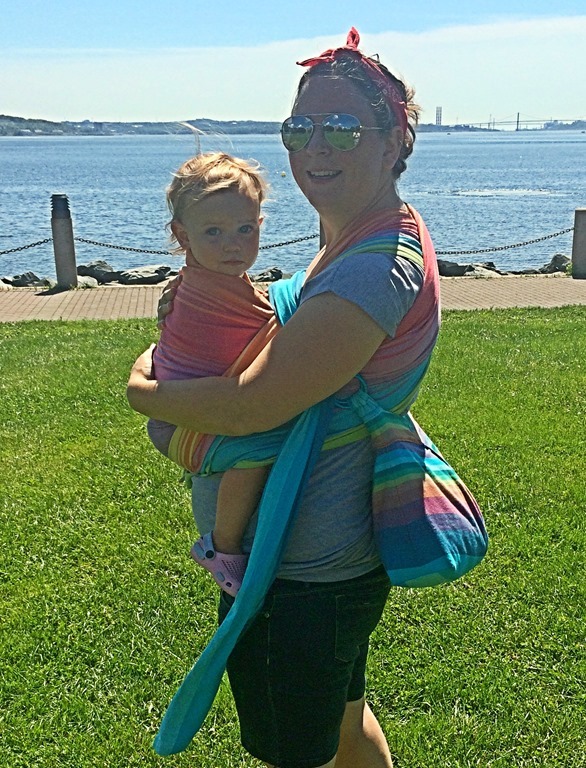 While using our ring sling it is easy enough to toss the bag over my opposite shoulder and cross body and have an easy distribution of weight. You can wear the strap under baby and carrier or you can throw it over top. I found both ways very comfortable, and easy to pick what worked best for the outing we were on. A friend asked me how the bag would work for tandem carry so I gave it a try. Now mind you I have my 3 year old on my back, my 19 month old on my front, and I am 29 weeks pregnant, but I managed a picture. I put the girls up and then I was able to take the strap and go under both the ring sling and between Payson and I on my back. I figured if it was between the girls and I it would be the most comfortable. I was able to quickly do it up through the rings once it was in place. And to take it off I just reversed getting it on. It was very doable, though I was squishing poor Zalah in my stomach. I was able to throw a few cloth diapers, sunscreen, my wallet, keys, wipes, random stuff, and my ring sling into the bag. I like the size of it because I don’t want to be carrying around my 50lb diaper bag and my 25lb kid at the same time. This allows me to have a bag that fits what I need for outings but doesn’t allow me to throw in the kitchen sink (which as an over packer tends to happen). And I will totally use this as more than a diaper bag, because it is awesome looking and I want to take it everywhere. You can find Liinalapsi –WearABaby on Facebook here, and Twitter here. And check out the hashtag #slingyroo on IG to see all of the beautiful bags that are out there. All feelings, opinions, and sentiments are my own. I was not paid to say anything, but was given this amazing bag to try.